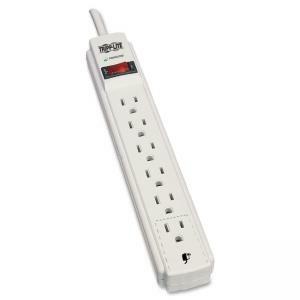 Surge protector offers economical, AC surge suppression for protection of workstations, desktop PCs, telecom systems and other sensitive electronics. Built-in, AC surge suppression rated at 790 joules shields connected equipment from surges, line noise, damage and performance problems due to transient surges. Six total outlets in a single row can accommodate one large transformer plug without covering remaining outlets and accepts a total of three transformers. Design also includes EMI/RFI noise filtering (up to 20dB), 15' cord, lighted power switch, 60 Hz frequency compatibility, 1875 output watts, 150 clamping voltage (RMS) and 15 amp resettable circuit breaker. Built-in LED confirms suppressor "protection present" (green) status. Suppressor plastic housing features keyhole mounting tabs for easy wall mounting.